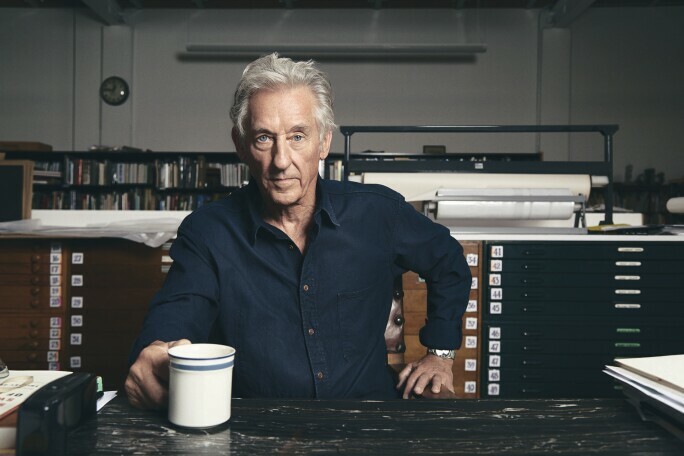 Though he is now in his 81st year, in many ways Ed Ruscha never seems to get old. This may have less to do with his famously blue eyes and easy-going charm than his enigmatic and effortlessly cool art. “It would be difficult to name an artist who has remained as consistently in the vanguard of contemporary art for as many years as Ed Ruscha,” remarked Linda Norden, the commissioner and co-curator, with Donna De Salvo, of Ruscha’s exhibition for the United States Pavilion at the 2005 Venice Biennale. 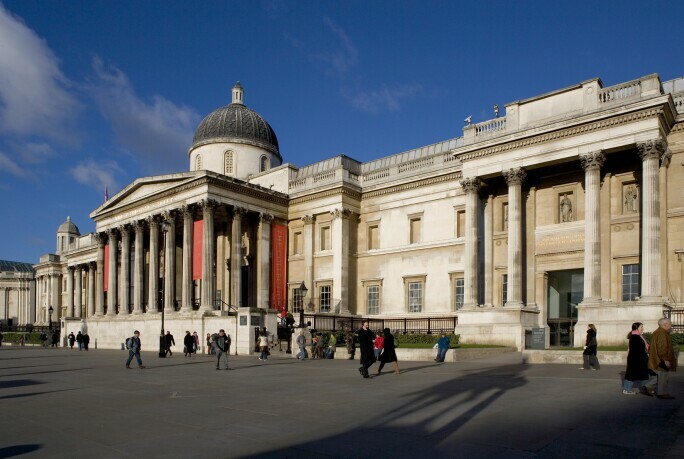 The 10 paintings that were shown at Venice share their title with Thomas Cole’s The Course of Empire (1834–1836), and now, from 11 June, the two series will be shown under the same roof at London’s National Gallery. The 19th-century landscape artist’s cycle is on loan from the New York Historical Society and part of the concurrent exhibition Thomas Cole: Eden to Empire. 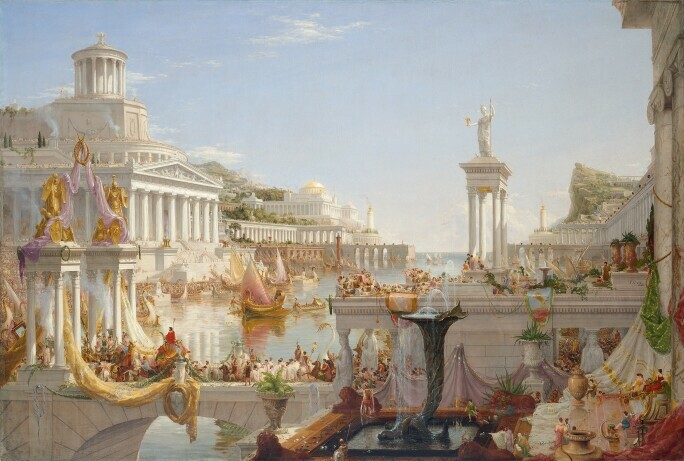 Thomas Cole, The Course of Empire: The Consummation of Empire, 1835-36. © Collection of The New-York Historical Society, New York. Digital image created by Oppenheimer Editions. Ruscha’s Course of Empire actually comprises two series. The first, originally titled Blue Collar, was made in 1992 and consists of five black-and-white paintings of industrial buildings emblazoned with capitalised letters that advertise their functions: “Trade School” or “Tool & Die”. Seven years later, Ruscha revisited each location, and created five new paintings, this time in colour. In this new series, one building now lies behind a chain-link fence; another is covered in (invented) Asian signage and graffiti. Following photography projects in which the artist documented LA street scenes over several decades, these works celebrate the functional designs of these sites through their pared-back appearances. Unlike Cole’s paintings, which portray the dramatic rise and demise of a fictional civilisation, Ruscha’s works provide a gentler but equally poignant vision of a landscape undergoing transformation. Ruscha said that Course of Empire is “more imaginary than documentary”, and that it reflects his “feelings about how things change – and that they don't always change for the better”. In recent years the artist may be letting slip his trademark ambivalence in favour of a view that is more critical of the ideas of progress and modernity. Since the 1960s, Ruscha has made paintings, prints, books, photographs, murals and even the occasional sculpture. He has synthesised the influences of Surrealism, Dada, Pop, Conceptualism, concrete poetry, graphic design, documentary photography and narrative film, making work that is influential in countless other fields. “OOF” reads a bold word painting from 1962. “1984” reads another, from 1967, done in gunpowder on paper. One wouldn’t dare to venture what his art is about, exactly; Ruscha himself has perfected a gnomic way of talking about it, as though he is as bemused by what he makes as anyone else. But Ruscha’s all-American biography can be understood by anyone, and its retelling has done much to ease the passage of his often-provocative art through the world. Born in Nebraska in 1937, Ruscha set out from Oklahoma in 1956 with his friend Mason Williams, driving his 1950 Ford Sedan along Route 66 toward California. Ruscha fell in love with Los Angeles – with its scale and speed, its car culture and roadside signage, the slightly seedy glamour of Hollywood and the beauty of the Californian landscape. As the Stranger in The Big Lebowski might note, Ruscha in Los Angeles was “the man for his time and place”. And he has managed to remain so, even as his place has changed over time.